Blue Nile's Astor Collection Review - Do they live up to the hype? This article will take you through the pros and cons of the new Astor collection by Blue Nile. I’m going to be looking at the specific Astor range, which replaces the Blue Nile Signature collection. To find out more about Blue Nile as a jeweler and the service they offer, please see my main Blue Nile review here. The Astor range by Blue Nile replaces their Signature collection. Both are their own in-house loose diamonds for sale. Blue Nile has long been known for having exclusivity agreements with various diamond wholesalers meaning the stones cannot be listed anywhere other than Blue Nile. This is the same for the new Astor range as it was for the Signature. This brings with it a little word of warning. Yes, you are certainly getting exclusivity. However, what you can’t do is compare the price that Blue Nile is listing directly against another retailer. You’re blind in that department, so you need to understand more about the diamonds themselves. This might lead you, as it should, to consider the accompanying certification. Blue Nile, in their Astor range place heavy weight on their GemEx certification. I need to urge caution for consumers here. I need to point out that not all certifications carry the same weight. GemEx really is a sales tool. It was developed by retailers for retailers as a marketing strategy. It’s not independent. Crucially, it is not a benchmark certification process for the entire diamond industry. Therefore any certification offered from them should not be taken at face value and you should do more research. Definitely don’t buy a diamond if it only has a GemEx certificate. You really do need to make sure the diamond you purchase has certification from the GIA or AGS. However, before we look at the Astor collection and what these diamonds offer, let’s look briefly at the Signature collection that they replace – so that you can understand the changes. All Blue Nile Signature Collection diamonds were graded by the GIA, AGSL and GCAL. So they came with a wealth of certificates. These diamonds were purported to be cut to ‘perfect’ proportions. However, as I explained in my main Blue Nile review, this statement wasn’t enough to guarantee that you – the consumer – were getting exceptional cuts. The Signature range had very high standards when it came to both depth and table percentages. 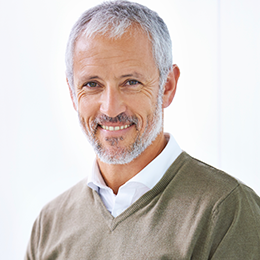 This led customers to believe they were getting something outstanding and unparalleled. However, these standards didn’t extend to the crown angle or the pavilion angle. This is an issue, because these need attention to create the best light performance. So, there were some obvious problems, as a customer, with the Blue Nile Signature series. Therefore, my initial reaction to the release of a replacement – the Astor range – was to welcome it. That’s quite a promise from them themselves, so what else do they say about the new Astor range? Firstly, they really do labor the point about the unmatched sparkle – so we need to see if that is true, which I’ll do in the next section. This is backed up by them stating that each Astor diamond receives the highest possible brilliance grade by GemEx – yet, as I explained above, this is kind of empty promises and you mustn’t ever buy based on a GemEx grade alone. They also go on to describe them as being exceptionally rare, and ranked as Excellent Cut from the GIA. It should be noted as well, that at this stage, Astor by Blue Nile is only available in the round and princess cuts which limits the options compared to the older Signature collection. You can choose to use these diamonds in your Build Your Own Ring and Build Your Own Earrings tools available by Blue Nile. However, as you’ll see in my Blue Nile main review, I’m not too impressed with these options and think you should instead opt for the customization options available from Whiteflash. How Good is Astor by Blue Nile? Let’s go back to the Signature collection for a moment. Remember the ‘perfect’ description? That doesn’t sound a million miles away from the ‘unmatched’ description in the Astor range. Now I’m possibly being pedantic, but to me using either of these words is setting the bar unbelievably high for the retailer – are the Astor diamonds really unmatched? Can no one else come close? Given that Blue Nile isn’t solely aimed at the exclusive end of the market, this makes for interesting reading. To me, this means that no other diamond can deliver sparkle to match an Astor diamond. I have to say I think this is incredibly unlikely. However, knowing that the Signature range really did have some flaws, I find this an enticing claim, so I wanted to look closer. So I began my research. I was initially struck by two things. Firstly, the descriptions provided by Blue Nile about the Astor range don’t actually give me real informative detail. They are a little generic. Secondly, I’m pretty sure some of those images are the exact same ones that were used in their Signature range. Therefore, my first question has to be – is the Astor really a new cut? This brings us back to the fact that, at the moment, the only cuts available are round or princess. These are the main cuts of the whole industry, so no surprise there. So what’s different about these diamonds? Well, it’s not the cut. Light performance is the selling point – remember all the talk about sparkle. Remember the GemEx promises – that each Blue Nile Astor diamond receives the ‘highest grade’. Having had a look at some of these diamonds, I’d agree that light performance is certainly their selling point. You can really see this in the arrows pattern, and I like it – a lot. However, what I want to see on their site is comparisons of a Blue Nile Astor diamond, and other ‘highest grade’ diamonds. I want to be able to compare like for like so that I can get to the bottom of that ‘unmatched’ claim. I don’t want to be comparing two diamonds which were never intended to be equal in the first place. What About the GemEx Certification? Now we’re getting in to slightly tricky waters as I explained at the beginning of this article. The claims within the Astor by Blue Nile marketing information are based on the ‘certification’. As you may know, I’ve written about AGS and GIA grading here. Note my terminology – grading. GIA does not certify diamonds. It grades them, and is very clear to point out that it isn’t a guarantee. So who are GemEx? They aren’t a substitute for independent diamond grading bodies. They are, as I said, a retailer’s sales tool. They themselves state that their certification is no guarantee of quality. This is of particular concern when you then discover that the diamonds are graded electronically only. It really is empty promises. To me, therefore, these assertions give me a little cause for concern. I know that consumers need certificates and documentation to help them in their decisions in the absence of having the time or inclination to study in depth about diamonds. So, they therefore need to be worth something and make clear sense. Firstly, are these diamonds ideal cut? Now I was struggling to see this to be the case. As I looked closer at the diamonds, I noticed imperfections and inconsistencies that to me don’t match the ideal bar. This throws in to question the ‘unmatched’ claim. Not only that, but I’m struggling to see how they are different from, or an improvement on, the Signature. In fact, in some cases, such as not being provided with an Optical Symmetry Analysis, I think I’m actually getting less information than with the Signature. I’m certainly left questioning how the Astor by Blue Nile are actually ‘unmatched’. However, this doesn’t mean that they are not exceptionally high quality diamonds. Just that I think you will find similar, and better, elsewhere. Which brings me to my usual point of do the Astor by Blue Nile diamonds represent good value for money? 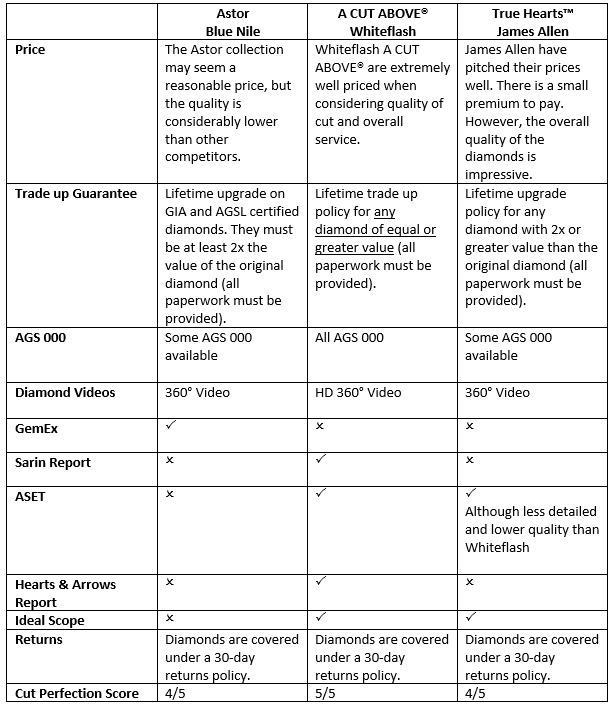 I have created a table to see how the Astor collection compares with the diamond competitors on services, price and quality. While the offerings by Blue Nile are a little rudimental, the basic certifications are all available. They also match the level of services provided by the other retailers. Although they may lack the detailed Sarin reports and ASET imaging offered by Whiteflash, they do provide a GemEx certification with their Astor collection diamonds however this is not a industry standard certification. Not all Trade Up Guarantees are the same. Take a look at my in-depth review on all these companies’ trade up guarantees here. It is easy to assume that for an in-house, exclusive diamond cut, you would pay a large premium for the pleasure (as is so often the case). The above examples show that the A CUT ABOVE diamond comes in $1,742 below Astor by Blue Nile and $248 below True Hearts™ by James Allen. 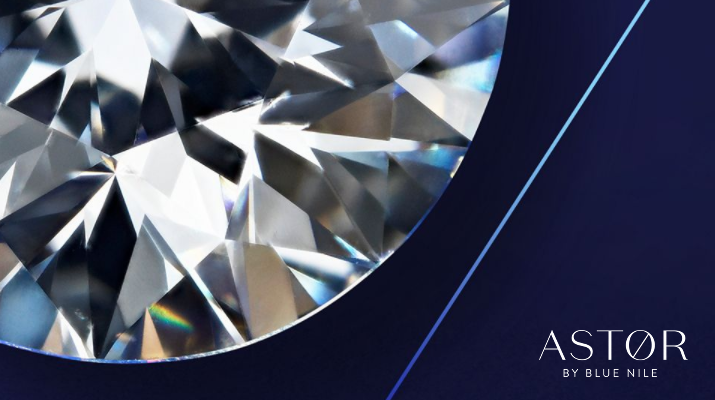 The most important thing I should point out here is while the James Allen diamond is as close in the specification of the A CUT ABOVE® as possible, there is no guarantee it would make the grade to be an A CUT ABOVE® diamond. 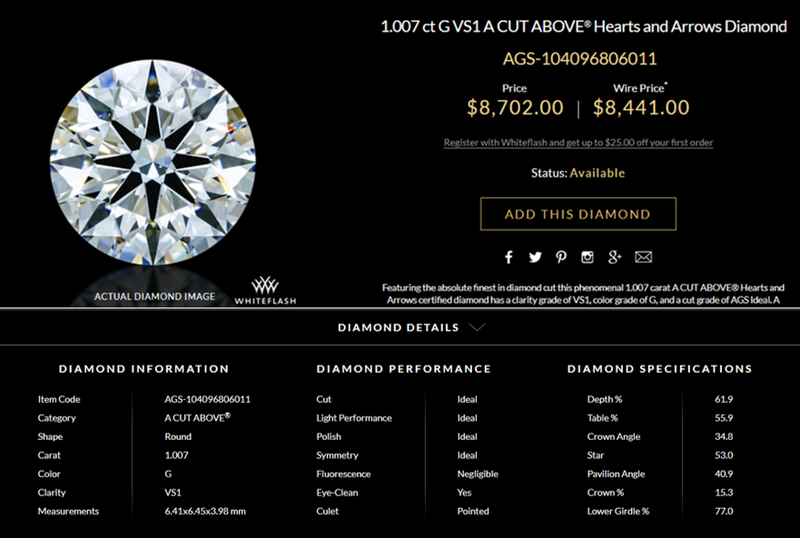 It is an AGS triple zero, but that is often not enough to become an A CUT ABOVE® diamond. What is clear, is that despite the exceptional quality of the A CUT ABOVE® diamond, it still come in at a lower price than its competitors. You are paying for quality, not a premium. My final thoughts are that, much to my disappointment, I don’t think Astor by Blue Nile Collection is offering anything significantly new or different. In fact, I think it really is just the Signature collection in a new disguise – not really helped by the imagery being the same or lacking. I urge you to look beyond the branding and instead focus on particular diamonds. Here you want to be able to pick a table diameter between 53-58% and a crown angle of between 34.3 and 35 degrees. Make sure you can see high contrast brilliance in the arrows pattern. When you do this, you can actually find some great diamonds in the Astor Range: Just don’t fall for the marketing spin. To conclude, if you are in any doubt, get in touch with me directly for any additional assistance. However If you’re looking for an exceptionally high quality round cut or princess cut diamonds, take a look at the A CUT ABOVE Diamonds line from Whiteflash. If you’re looking for Fancy Shape Diamonds take a look at James Allen.